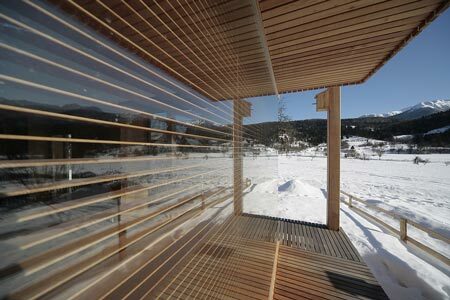 Alpine Hut Emphasizes Slovenia Thanks to OFIS arhitekti | Homesthetics - Inspiring ideas for your home. The Triglav National Park is Slovenia’s only national park and it is named after the highest mountain in the heart of the park itself. 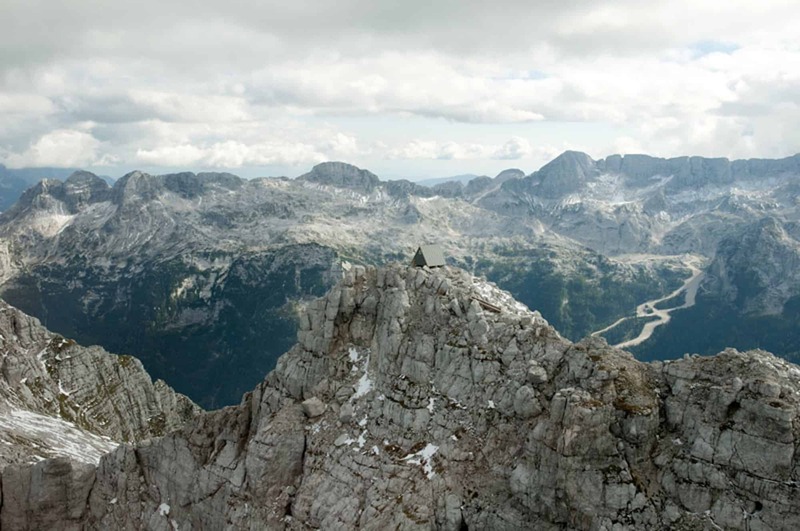 It is located in the north-west of Slovenia, more precisely in the Julian Alps. Being the only national park in the country, the development rules are pretty strict, with good reason too. The nature is simply too beautiful there for them to let anyone harm it, so getting a building permit is an almost impossible task if you don’t know what you’re doing. 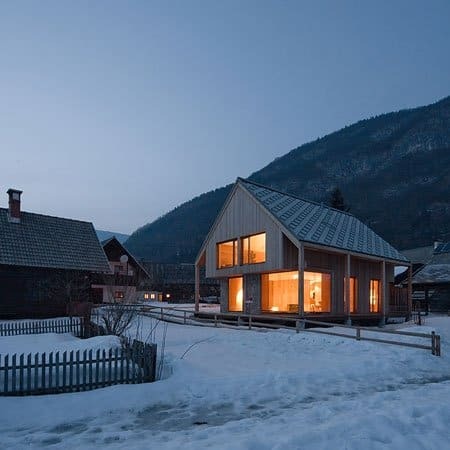 But, OFIS arhitekti have completed a compact alpine residence in the small village of Stara Fuzina inside the Triglav National Park and we invite you to cast a glance over it. 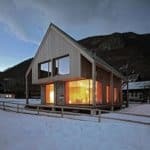 The basics of the Alpine Hut draw inspiration from the local alpine hut typology which has been updated and modernized by the architecture studio. 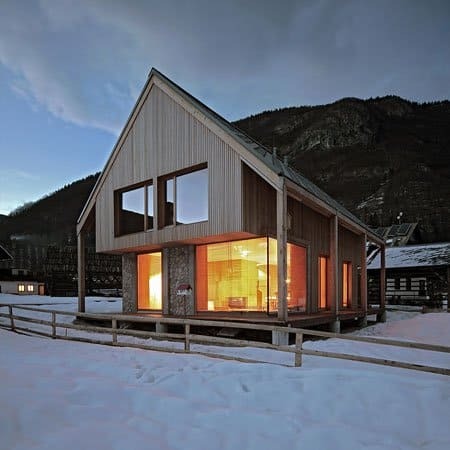 They have decided to use locally sourced materials such as wood and stone in order to make the client’s wishes of a sustainable home with windows facing towards the expansive mountainside views. 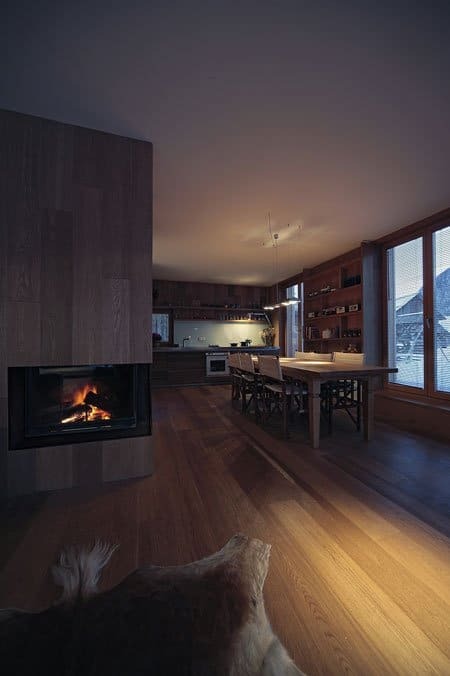 Inside of the Alpine Hut there are three bedrooms and a spiral staircase that wraps around a central fireplace. 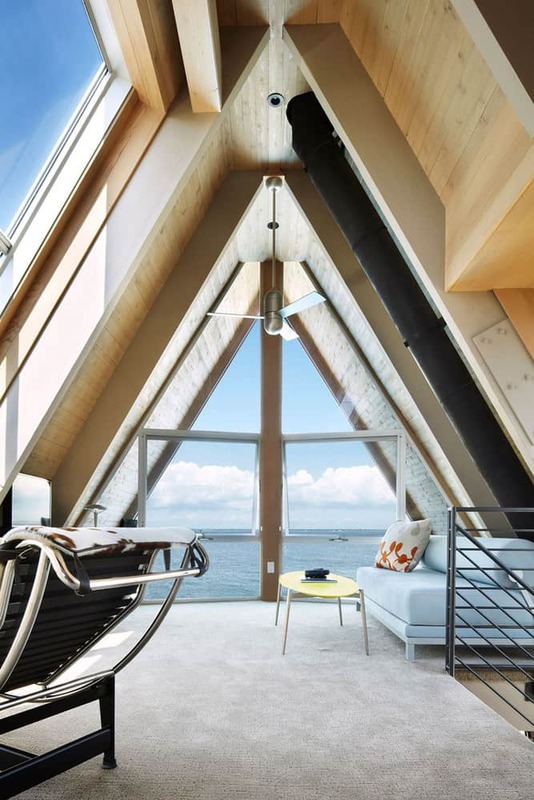 The main floor has a very large corner window that not only offers breathtaking views of the surrounding environment, but it also helps heat up the interior during the sunny days as well as provide natural lighting for the large living and dining area. 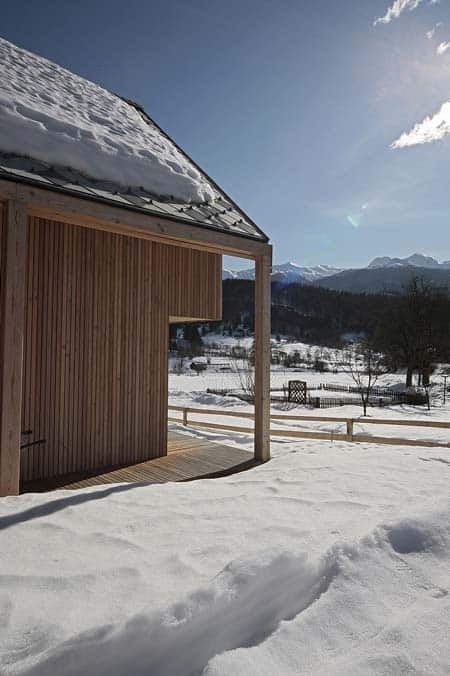 This hut is situated in a small Alpine village, part of the Triglav national park with very strict rules on construction and architectural design. The client bought the site together with an existing construction permit for a generic project. 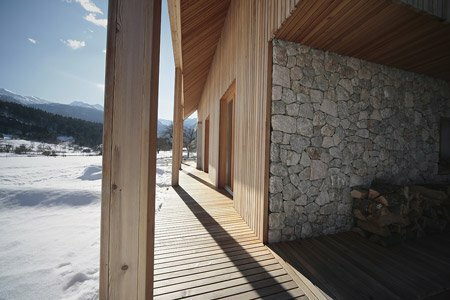 The demand of the client was not to change the construction permit but to change the elements of the house to suit his family – to position the openings toward the views and to increase its sustainability. 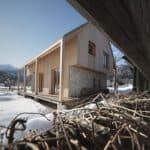 The volume of the house is 6 x 11 meters and it has a 42 degree pitched roof. External dimensions and material types are from the existing project. 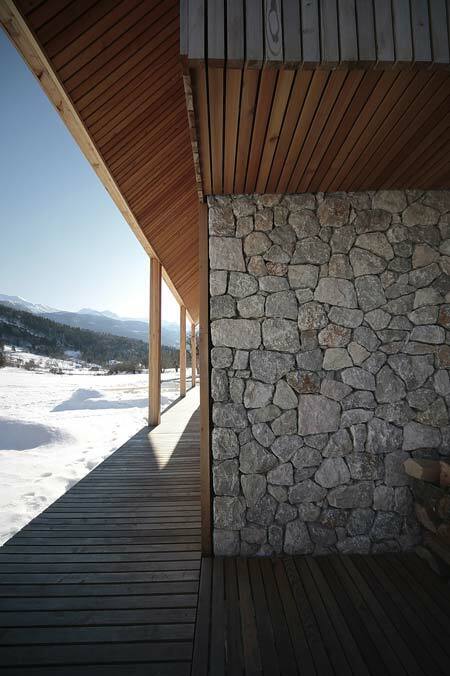 Materials – the elements such as stone, wooden columns and facade patterns are all taken from the local environment and reinstate the dialogue of the surrounding typology. 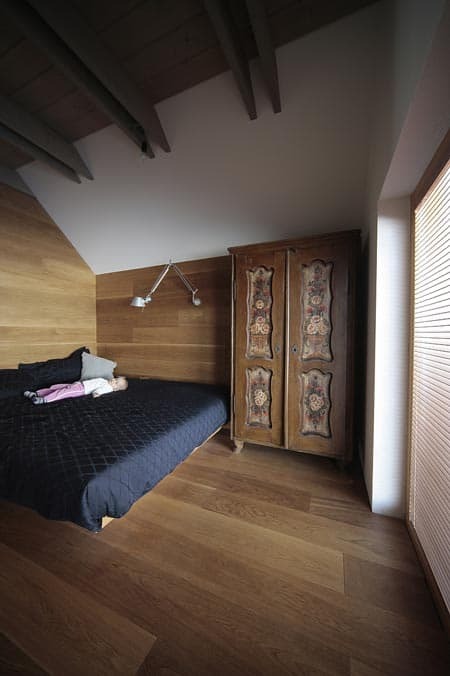 Interior organization suits the needs of the family and is very rational. The central staircase rotates around the fireplace that heats both floors. 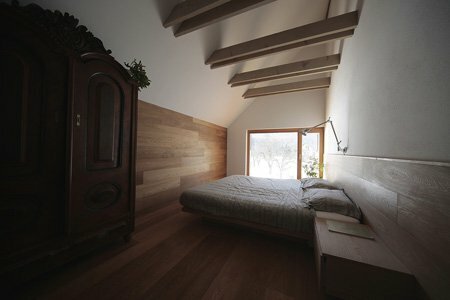 There are 3 bedrooms, a bath with sauna on the top floor and minimal corridors. 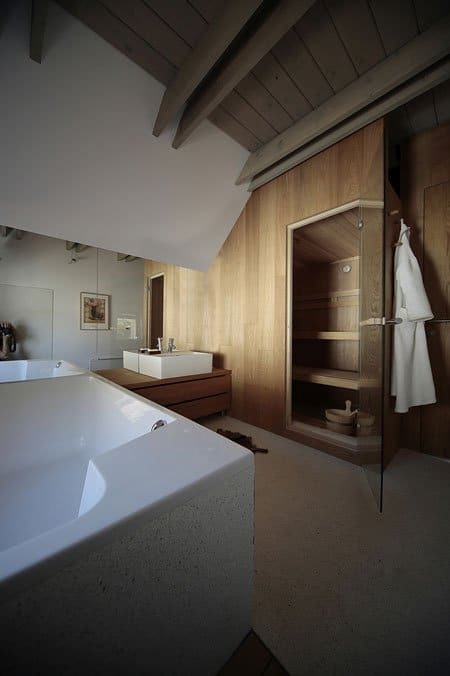 The ground floor is an open plan room with kitchen; dinning and living, storage is under the staircase. 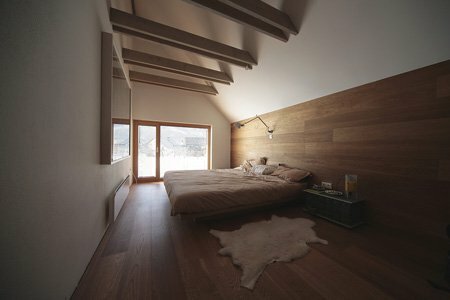 The level is partially lower so the window shelves act as a sofa with views toward the mountains. 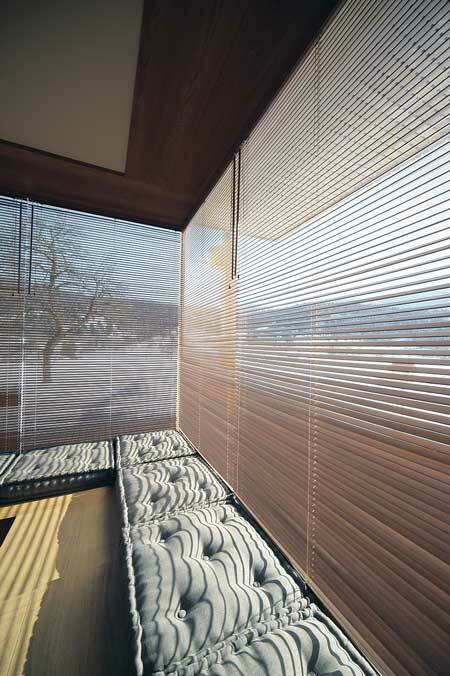 Large corner window were positioned towards the sun therefore during sunny winter days no heating is required. 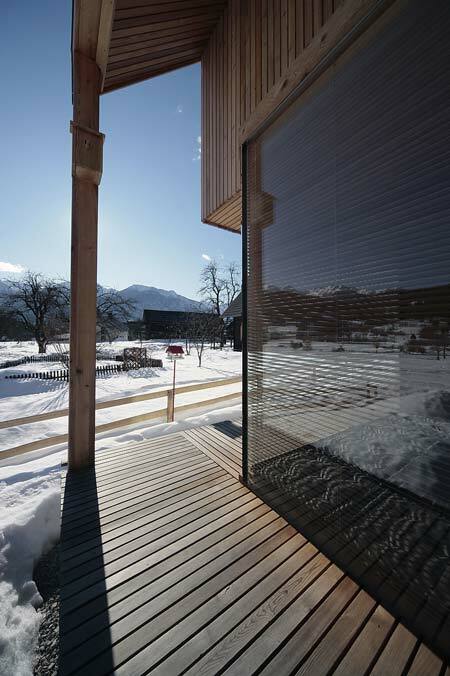 Extra thermal insulation is put between the wooden cladding – both in exterior and interior, black foil that is put behind the wood absorbs the heat of the sun and transforms it onto the walls. The upper floor is cantilevered over the front of the ground floor and acts as sun protector in summer when the sun is higher. 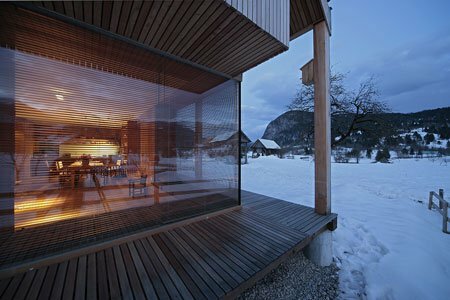 Rain water is collected from the roof and transported through vertical pipes which are inserted into wooden beams. What do you think about this Alpine Hut, how do you see the balance between materials ? We would love to hear from you in the comment section below !